Due to its characteristics and composition, balanced feed for piglets is a product with a very specific need of protective packaging. This was precisely one of the challenges that Grupo Nutec, leader of animal nutrition in Mexico, raised to Innova Maquinaria. 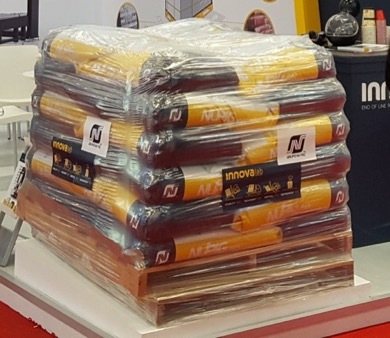 Thanks to Innova’s Stretch Hood system, the Mexican group has not only achieved a better protection, but also a better image and presentation of their palletized products. Grupo Nutec is one of the leading companies in the animal feed sector in Mexico. In addition to the production of feed, it also offers specialized products in the petfood and aquafarming sector, as well as cutting-edge advisory, research and development services in animal nutrition. Innova has participated in this search for continuous improvement with an end-of-line packaging project at its production plant in the municipality of Colón, Querétaro, specialized in swine feeding. Grupo Nutec had a very specific problem of final protection of their food pallets. At the time they used a rotary plate wrapping machine without pre-stretch for the packaging of their pallets, which did not provide them with the necessary total protection or an optimal presentation of their product. In addition, the use of film was considerable, since they used more plastic with the wrapping system. The company also sought to improve the containment and stability of its loads for transport throughout the country. 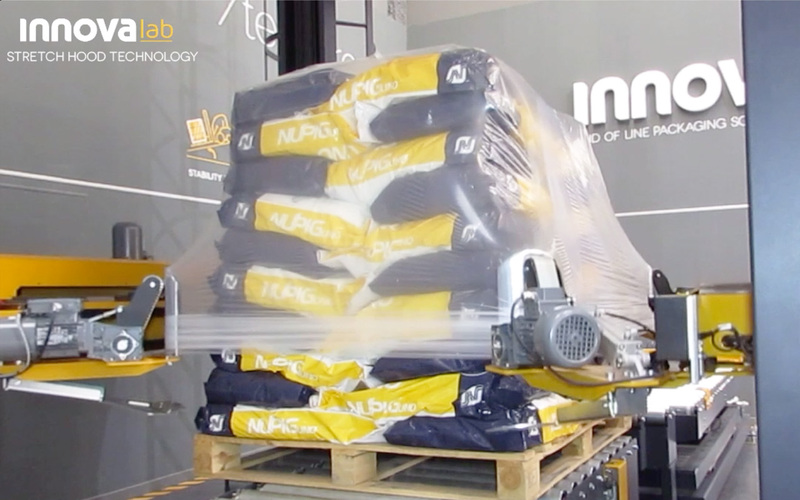 Innova designed and manufactured the final packaging solution for Grupo Nutec, taking into account the mentioned requirements of protection, stability and visibility. Innova proposed the Stretch Hood packaging system, precisely because the hood is fully adapted to Nutec bags and provides waterproof and other external elements protection. The Stretch hooder is complemented by a Vertical Strapping machine that guarantees the total stability of its pallets for handling and transport. The final project of Nutec consisted of a line of Stretch Hood ETHERNA PRO2-S2, with the capacity to pack 2 different sizes of pallets up to 1,000 kg. This was complemented with a Vertical Strapping System ETHERNA PRO to guarantee the stability and subjection of the feed bags. Thanks to the Stretch Hood solution, Grupo Nutec has managed to improve not only the protection of its products and its corporate brand image, but also the saving of film used by pallet. The film savings is one of the key aspects in which Innova continues to work together with Grupo Nutec, via its after sales and film certification services. The objective is to optimize Nutec’s plastic consumption even further, improving its production and costs. Grupo Nutec relies on Innova Maquinaria since 2017 for the protection and packaging of its products. 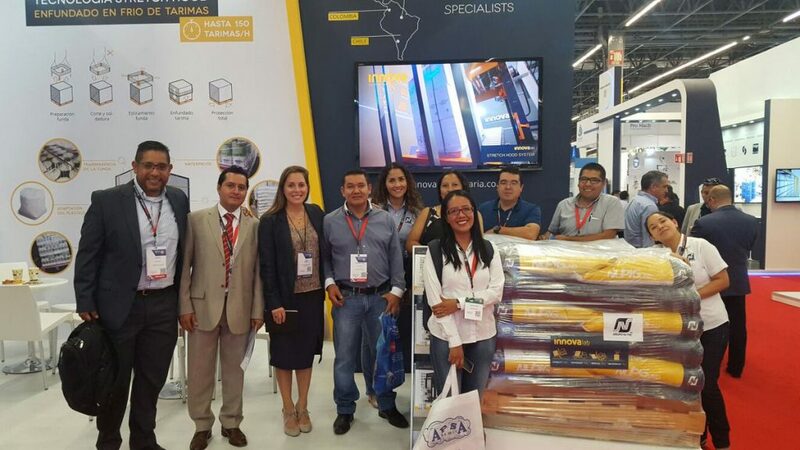 For Innova, the challenge posed by the Mexican company has been enormously enriching and has allowed us to adapt our packaging solutions to a sector as specialized as that of animal feed. Let’s continue working to make Grupo Nutec’s success even greater!